Meet the violet demoiselle Neopomacentrus violascens (shown above in a photo by J. E. Randall). This little fish (adults get up to about 7.5 cm in length) is found in tropical waters of the western Pacific, from Japan in the north, south and east to northern Australia and Vanuatu. They usually associate in large schools around inshore reefs, and can commonly be found hanging around outcropping structures over soft bottoms such as coral or rocky outcrops, or wharf pilings (Koh et al. 1997). Violet demoiselles feed on small plant or animal plankton, such as copepods or algae. The genus this species belongs to, Neopomacentrus, is one of the more recently recognised genera of the damselfish family Pomacentridae. It is similar to two larger genera in the family, Abudefduf and Pomacentrus, but differs from the former in having the hind margin of the preopercle (the anterior one of the bones making up the operculum or gill cover) crenulate or serrate rather than smooth. Pomacentrus has a similar preopercle, but has the suborbital region at least partially naked whereas Neopomacentrus has that region entirely scaly. Neopomacentrus violascens has a distinctive colour pattern, which is mostly a purplish brown, with bright yellow on the caudal fin and the rear of the dorsal fin. According to Fishbase, individuals of this species form pairs when mating, and the females lay eggs that sink to the bottom and stick to the substrate. The eggs are then guarded and aerated by the males. I have come across reference to this species having been bred in captivity though I get the impression that they are not one of the most commonly kept aquarium fish. This may be because they are somewhat dull in coloration compared to related species, and they are fairly retiring in character. 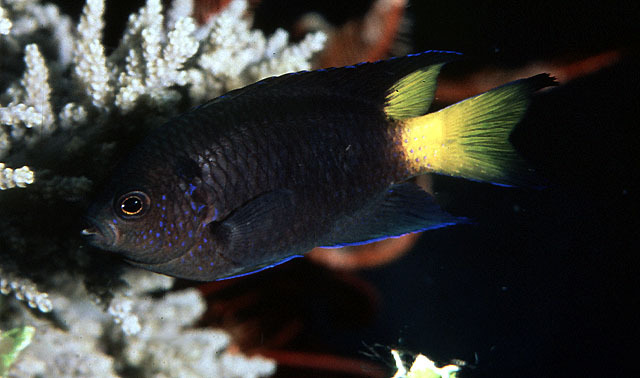 A recent blog post at Zoo Volunteer noted that damselfish species are rarely bred commercially due to the difficulty of providing suitable conditions. Instead, the market for species of this family is usually supplied with wild-caught individuals, commonly collected through the use of cyanide to essentially suffocate the fish until they lose conciousness. Not particularly pleasant for the fish, and arguably not that pleasant for the aquarist either as fish obtained in this method tend to have a much reduced lifespan. Koh, J. R., J. G. Myoung & Y. U. Kim. 1997. Morphological study on the fishes of the family Pomacentridae. I. A taxonomical revision of the family Pomacentridae (Pisces; Perciformes) from Korea. Korean Journal of Systematic Zoology 13 (2): 173–192. Abudefduf is an odd name, what is its etymology? I'm glad you asked! As it happens, the answer was already discussed in my earlier post on plectorhinchines. "Abudefduf" is of Arabic extraction. It's one of the section labels used in Forsskål's (1775) posthumous Descriptiones animalium; later authors accepted it as a genus name though Forsskål himself probably only meant it as a vernacular label. Though most of Forsskål's other section names have slipped into obscurity, a couple have become established by long usage. From my minimal knowledge of Arabic, Abudefduf should mean "father of defduf", whatever defduf is. The name is from Arabic abu, "the one with"; and def, "side", and the intensive plural ending -duf. So, the name means "the one with prominent sides". Yes, abu does literally mean father, but it seems it is often used in that sense in animal names and also nicknames of people. E. g. the shoebill is called abu markub, with markub meaning shoe.